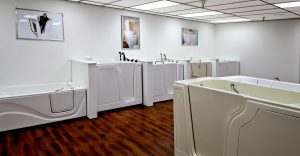 Come see & sit in our walk-in bathtubs. We’ll help you find the best fit for you and your bathroom — before you buy. If you’re in the Los Angeles area and considering a walk-in tub, we are easily accessible from Los Angeles, Orange and Ventura Counties and the Inland Empire. With 14 walk-in bathtub models to choose from, you can find the best fit for your situation. From narrow to wide and shallow to deep, the Bliss Tubs showroom has the ideal tub to fit your needs. 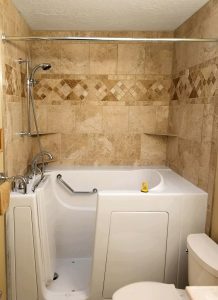 We also offer slide-in bathtubs designed for easy access from a wheelchair and other needs. Your Bliss Tubs walk-in bathtub easily converts to a walk-in tub with shower combination. Just opt for our convenient shower slide bar. Once your installer mounts the slide bar to the wall, you can experience an energizing shower in your walk-in bath. We also offer shower rods, hooks, and shower curtains. Call us to learn more or ask about our walk-in shower tub options and accessories when you visit our showroom. With reliable, top-of-the-line components, Bliss Tubs walk-in tubs make bathing easier, safer and more therapeutic than ever. Melt the cares of the world away all in the comfort of your own home with a Bliss Tubs walk-in bathtub. When you purchase a Bliss Tubs walk-in tub, you can be comfortable that your well-designed walk-in tub will include a complete package of features. Our expert team will remove your existing tub or modify your current shower space, as applicable, before carefully installing your new walk-in tub. The job will be completed with a thorough clean-up and a walk-through on how to best use your new walk-in bathtub. 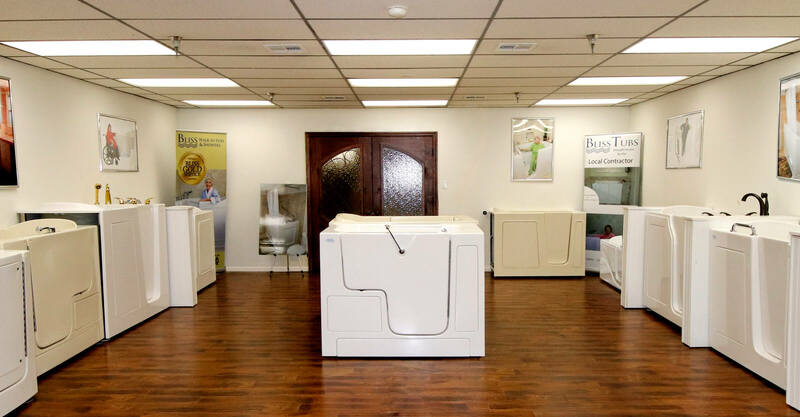 Protect your independence and enjoy your bathing much more than you have in years… with the safety and affordability of Bliss Tubs Walk-in Tubs. Visit our Contact page for a map and directions.